Andre James from Row Three alerted me to this poster for My Life in Ruins and to the visual resemblance it has with this poster we saw not long ago for Mamma Mia! 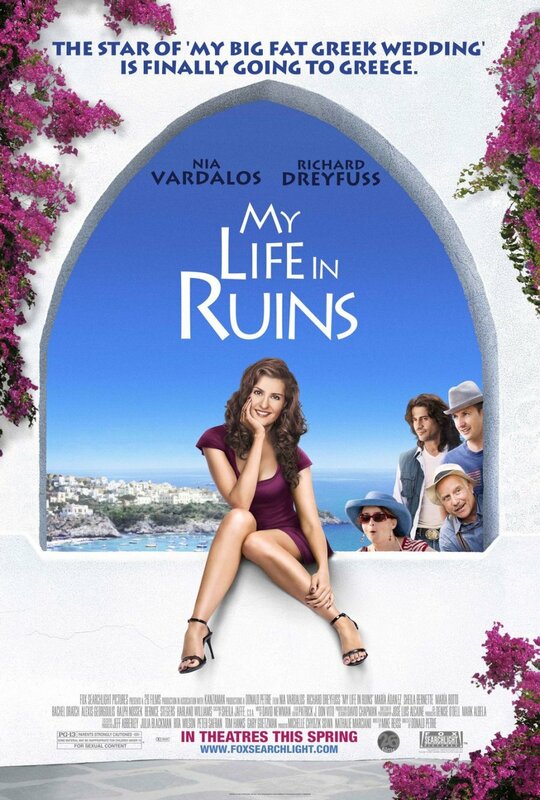 Initially I thought that maybe the poster for My Life in Ruins was somehow referencing or parodying the Mamma Mia! one. But looking at the movie’s story and at the poster I’m just not seeing it. So that leaves me with the explanation that both films are set in Greece and both happened to choose pretty much the same typical Greek background. 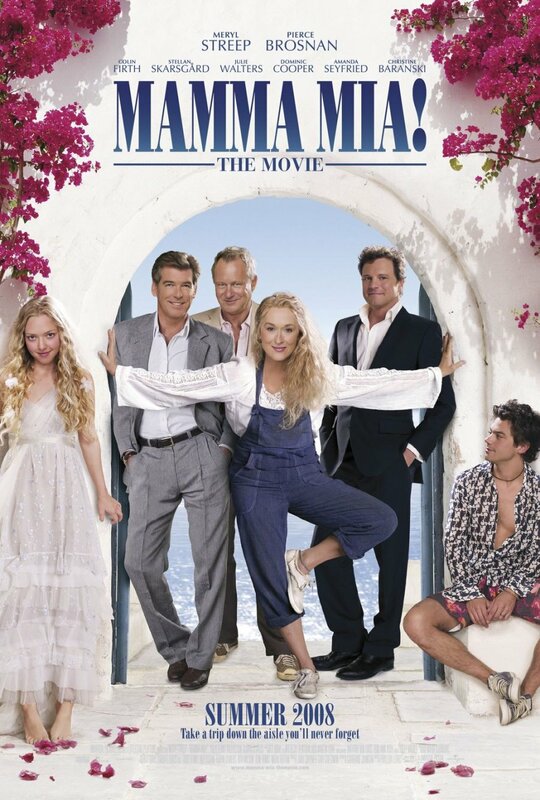 But considering that to be the case, didn’t the people behind the My Life in Ruins one see the poster campaign for Mamma Mia! ? That film was pretty popular, so it seems like that would be hard to escape. But if they did notice the resemblance, why wasn’t this version of the poster junked? Honestly the comparison is not kind to the newer poster. Did they think people wouldn’t notice? Did they think they wouldn’t care? i suppose they’re similiar in that there is a woman in the middle standing in front of a white arch. ask a hundred designers to make a poster for a romantic comedy that takes place in greece and eighty of them have an arch and flowers in them. the more logical explanation is the same reason they use old music in new trailers. subconsciously it reminds you of something you already like. notice nobody uses music from BATTLEFIELD EARTH for anything. MAMMA MIA! made a shitton of money and appeals to the same audience. this is a no-brainer. if anything, look at nia vardarlos’ MY BIG FAT GREEK WEDDING poster which is her and her fella on a white background with a bunch of onlookers leaning in from the side. and while i am at it, i think the poster for CONNIE & CARLA is one of the most brilliant posters i the last decade. they found a way to put them as themselves and in drag on the same poster without split-screening it or making it look stupid. it makes the movie look like fun and sells the entire concept. I don’t think the arch as a graphic device is distinctive enough on its own to make Ruins look like it’s riffing off of Mamma Mia. To me the “inspired by” similarity has more to do with the flowers used as trim than anything else. Obviously, there’s a combination of things that make these posters very similar. But to me, it’s the flowers that put the Ruins poster over the top. So…I looked both movies up on IMDB, and guess what? Apparently, they were both produced by Tom Hanks and Rita Wilson. My guess would be after the success of Mamma Mia, they thought they would do a sorta “thematic sequel” to it. The greek scenario is pretty much the same everywhere there. The Islands look alike and the white washes houses are very similiar. Been greek myself I don’t see anything wrong btwn both posters. The stories are diffrerent but the Country is the same. I’ll enjoy “My Life In Ruins” as much as I did with “Mama Mia” and “Summer Lovers”.